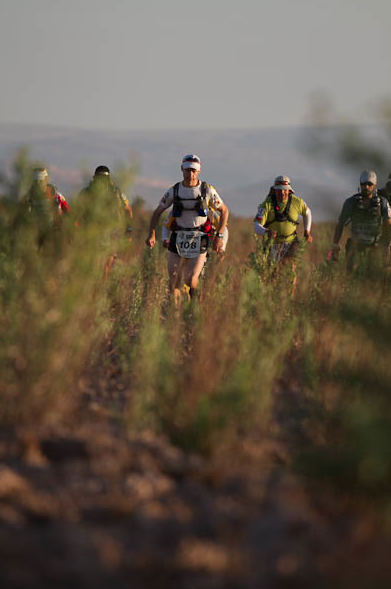 Stage 3 had a mix of everything and after two tough days of running is generally considered to be one of the most difficult, if not the most difficult, of the stages. 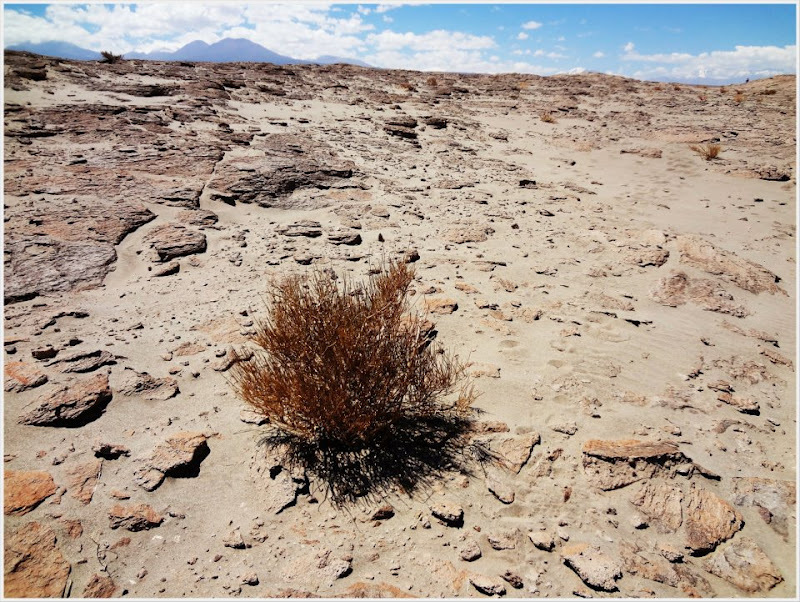 We all started off together heading into a salt flat that was covered with small bushes and shrubs. 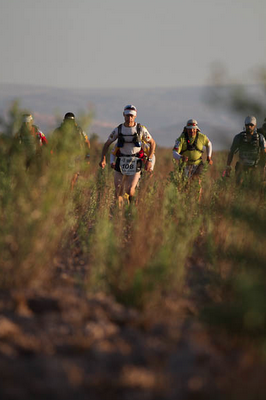 It was a strange start as everyone wanted to run, but almost nobody could because of the really difficult terrain. The whole pack was held close together and so I started out with the leaders and managed to stay with them for a good while. The next section was a sand road and this is where I think the people with previous desert experience showed their skill. It was not too long or difficult, but rolled up and down like a beautiful beach. I dropped off the leaders pace and kept rolling along at my pace slowly catching a few runners and settling into a nice place with Massi (Italy). After the sand we got a slight reprieve as we ran along a well-packed dirt road for 3km or 4km. However, not much later the inevitable happened and the flags led from the road directly into another thick salt flat. I started out running this, but as we approached checkpoint two I was doing a combination of walking and running and a group from behind caught up to me. 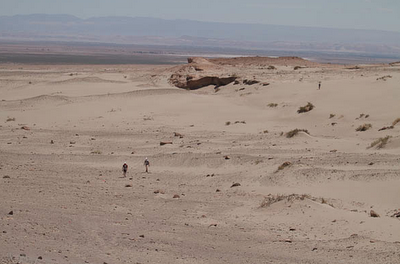 Fortunately the next section after the salt flat was a true dry, hot desert with deep sand. 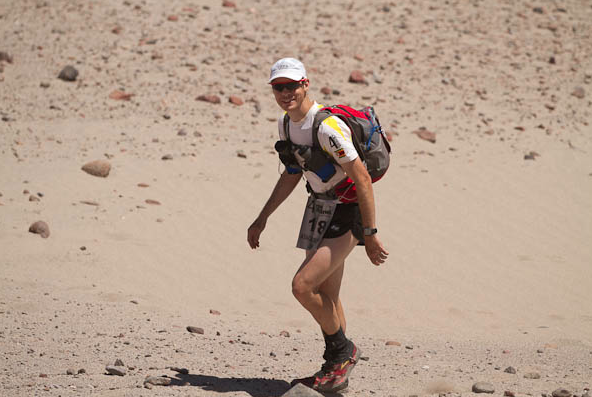 I managed to find a rhythm here running with Jan (Belgium) and slowly catching the group in front of us. I enjoyed the fact that I was catching a few people and we made some good time to checkpoint 3. The next part of the day was where most people struggle. It was getting hot and although we could see camp, or what we thought was the camp, there were still 12km to 13km to go. The ground was sandy, but rocky meaning that every step was changing from cushioned ground to hard rock and this made the going very tough. In addition to that we had to cross over three river beds that had steep slopes and climbs back up to the other side. I was walking and running by myself on this stage and when Steven (Belgium) caught up to me I was happy for the company and we worked really well together. 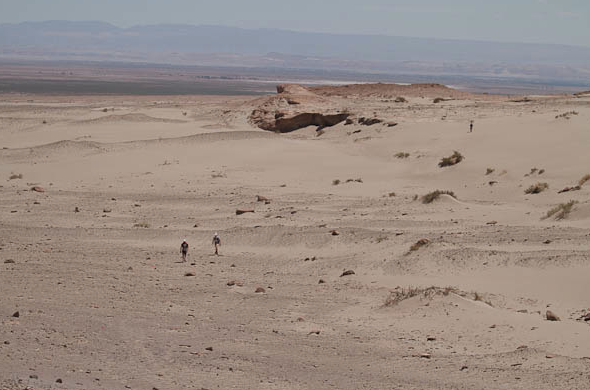 We ran together through the dunes and sand and worked our way towards the finish which we could see, for sure this time, from about 5km out. 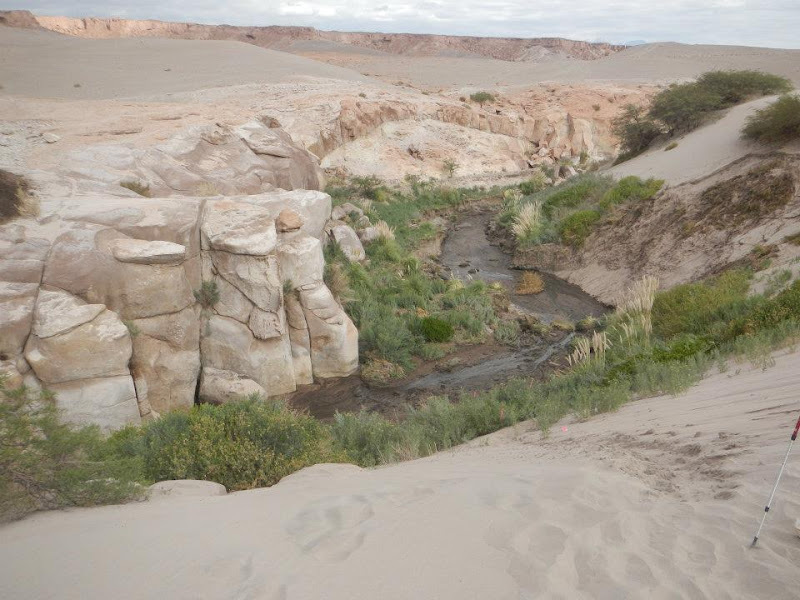 Every time there was an obvious route to the finish we made a left turn and either ran down a dune, or ran into a river, or along a dry river bed to a massive climb on the other side. After these three left turns, and I guess some curving winding rights, we really were just a few hundred meters from the finish. The finish however, was on the other side of yet another river bed. This time we descended and then had to climb up what seemed like a long, never-ending slope to get to the finish. It was a tough, and yet appropriate, ending to a very tough stage. 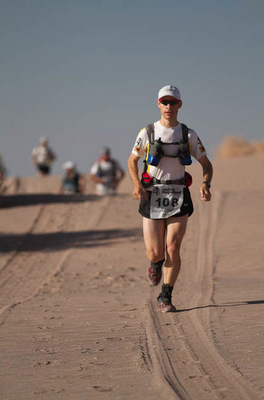 I finished strong and think that this was one of my best stages of the race. I was extremely pleased to come in 6th, a few seconds behind 5th, and an improvement on previous day's run.